Increase speed to medium and knead until dough comes together and pulls away from the sides, about 5-10 minutes. If the dough is sticky, add a tbsp-ful of flour at a time until it is smooth and elastic. Once dough is risen, bake for about 30 minutes or until golden brown on the outside (the inside should register 190°F). Allow to cool completely on a cooling rack before slicing or serving. This could possibly be the most difficult bread I’ve ever had to make. But it’s also the most rewarding! You see, making Panda Bread isn’t easy, especially when you’re trying to make a face inside a bread (not something I do every day!). However, the hard work is so worth it when you slice open the sandwich loaf, peek inside and see a fun panda staring back at you. Who doesn’t love that? To start off right with this bread, I suggest using unbleached all-purpose flour, as opposed to bread flour, because you’ll be working the bread a lot and don’t want the gluten to toughen. Gold Medal’s unbleached all-purpose flour is definitely up to the challenge. Admittedly, I ran into some roadblocks while making this bread. The biggest one was deciding how to make the green dough. Though matcha, or green tea powder, works well and delivers a unique flavor, it’s also crazy expensive. If you’re not willing to drop some serious change on the stuff, green food coloring will also do the trick. Another roadblock was, of course, making the panda face. These photos, combined with recipe directions, give step-by-step instructions on how to construct the face. As you can see, mine still didn’t turn out perfectly, but it was pretty darn close! Plus, I think it adds character. Don’t get me wrong – despite the challenges, this was an incredibly fun, unique bread to make. And the flavor – a light, enriched white sandwich bread – was delightful. Though it was a little weird eating a panda’s face. This recipe would be the perfect thing to make with kids or for a zoo-themed party, or even for fun sandwiches. 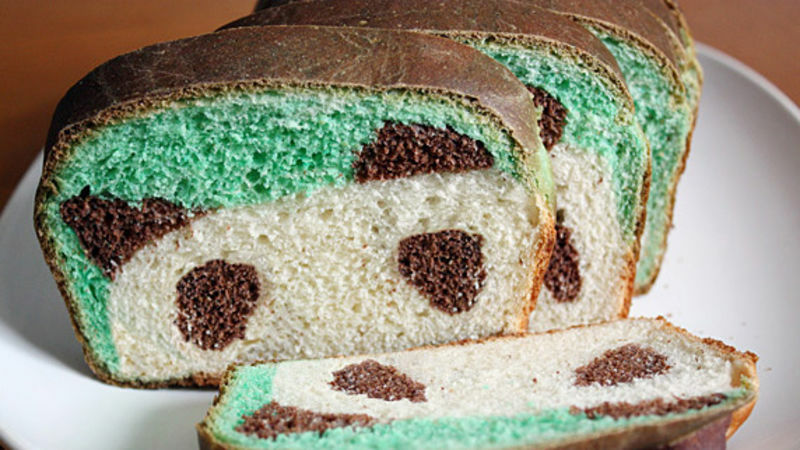 Heck, once you make this bread, you can make multi-“face”ted breads (ahem, pardon the pun). Or you can make it just to impress your peeps. That’s as good a reason as any!